Facets Group is a well established and rapidly expanding business house that has extensive experience in providing stocks, security and mutual fund related services alongside being a supplier & exporter of cut and polished diamonds to both private clients and companies. We strive to maintain a high quality service using the broad skill base of our experienced staff, in an informal and friendly environment at competitive rates. 2. 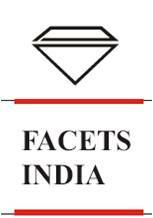 Facets India is the export house and supplier of diamonds.